How to make an invoice for your own business organization? Invoice helps to keep the record of billing details of the provided services or products. If you provide a suitable invoice to your clients along while selling a product, it will obviously attract the customers’ attention. You will be able to make a trustworthy seller-buyer relationship. Some probable benefits of creating your own invoice templates are listed below. • It will be very economical and your net profit will be increased if you start creating blank invoice designs on your own. • You may not always like the design of invoice provided by professional customizers. Making it yourself will allow you to customize the document according to your choice. • You can finish the designing of an invoice form within a very short time span. It doesn’t require maximum effort or heavy skill to customize the blank templates. To design an invoice form some basic things you must keep in mind. Don’t forget to maintain professionalism in your design. Generally an invoice consists of three basic things- the header part, logo of the respective organization and a chart to itemize the provided service with some details like quantity, date, rate etc. To know how to make an invoice, follow the simple steps given below. • Include a header part- Including the header is the first job you need to do while customizing an invoice. The header includes the name of the organization. If you are doing it in Microsoft Word, you will find a header panel at the top of the page. For any other software make sure to keep the organization’s name at the centre of the page. Always use professional font styles to write the header. • Give invoice information- Don’t forget to include sufficient invoice details while customizing the templates. Relevant details of the invoicing person along with the contact information must be mentioned. Use an invoice number and generating date as well. • Itemize your service- Make a diagram to enter the details regarding your provided services. You may include the price, quantity, name of the services or products, total billing details in the invoice diagram. Last but not the least you can add a logo of your business association at the top of the invoice form. You have already gathered enough knowledge on how to make an invoice. But it is also mandatory to choose the right software to customize your invoice form. Microsoft word is one of the easiest ways to do the customization. Apart from this you can use Microsoft Excel too. If this software is not available, you can try online invoice generator. You will find ample number of invoice generating sites which sometimes offer free invoice templates. Invoice has become the most important business material these days. So providing proper invoice form along with the services is also mandatory. 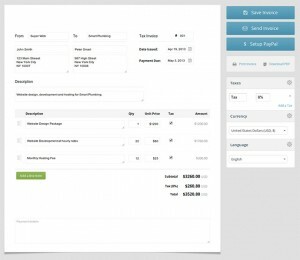 What is the basic use of sample invoice template? © 2019 Blank Invoice. All Right Reserved.